Still Time to Make a Difference in 2015! Thank you and many blessings in the new year. With very little access to capital, how can an entrepreneurial woman in rural Senegal start or grow her business? For the last 12 years, part of our efforts are directed toward economic assistance, allowing those in West Africa a chance to have access to capital in the form of microloans. These tiny cash loans, averaging $60, are used by the recipient to start a small business or otherwise actively pursue the opportunity to turn this small amount into something larger. They are almost always fully repaid, with a paid back rate of around 95%. We recently caught up with a few of these women in the town of Podor, in the north of Senegal. We sat with them and learned more about what they do and hear their success stories. Dibor Faye used the loan she received to make ice cream. It is not the conventional kind like we think of, but a mixture of fruit from the Baobab tree (called Monkey Bread), combined with water and sugar and then frozen. It's quite delicious and fairly simple to make. While knowing there would be a strong demand for it, she had no money or resource of any kind to buy the ingredients, including sugar and little plastic bags used to make single servings to sell. Her loan was for $50, part of which she also used to rent a small freezer space from a nearby shop. Over the next few months, she developed a clientele. It is very hot and dry in Podor, so people liked being able to buy a small portion of this "ice cream" for a few pennies. She eventually turned her $50 loan into $290, for a profit (after she repaid the loan) of $240! Awa Diop used her loan to buy and raise a sheep, which gave birth to a lamb. She fed them both with special feed to get them ready for the annual "feast" or meal celebration, not unlike our Thanksgiving. She sold them both for a tidy profit of over $200. In talking about what she had planned for her new income, she motioned toward a young child, who was handicapped. She was able to buy medicine and clothes (the child cannot walk and wears out clothing by crawling around on hands and knees). She took the girl to a doctor and paid her medical bills. It was a life-changing intervention that cost very little. Further, Awa is very proud that she was able to earn this money through her own hard work and take care of her family. Khadidiatou Ndiaye used her $45 loan money to buy seed to grow rice. She planted on her local small farm patch where she grew and cared for the rice, and eventually harvested thirty 50 lb bags of rice. She borrowed a local donkey cart to transport the rice to her house. She sold all the rice one bag at a time from her home, as local people came to buy from her. Because the rice was locally grown and very good, she sold out (she kept some seed for next year). She made over $300 - more money than she has ever made! She was very pleased with results and thanked Andando for the help. Now that her loan is paid back, someone else in the community can borrow the money as the loans revolve in order to give everyone a chance. She concluded her remarks by saying: "We want to escape from Poverty. We will work hard. Our whole community will benefit". These encouraging stories illustrate a key principle of how Andando is operated - a little bit of money goes a long way. You don't have to spend vast amounts of money to make a big difference, indeed the opposite is often true. And we don't have a lot of overhead, in fact very little. We like to keep things efficient and productive. It doesn't take a lot of money to change someone's life. The rural health post in Thiamene Taba, Senegal is now officially open! Through hard work and a great deal of community organizing, this project came together and is now operational. This facility will handle basic health services and the delivery of babies in the village. Access to health care in remote parts of Senegal is extremely limited, which is further exacerbated by problematic road conditions and unreliable transport. To seek treatment, people must walk long distances or find transport of some form, which often means hitching a ride on a cart drawn by a donkey. While this works some of the time, it is extremely problematic in emergency situations, especially in cases of child birth. This health post will greatly alleviate problems associated with these situations. Three village members have received extensive training from the government and gained experience at nearby health clinics. They will staff the facility and be on call for emergency situations. They also provide services like monthly child-weighing to monitor for malnutrition and basic first aid. The health post will also be used to host vaccination efforts and clinics from outside organizations. We recently had the opportunity to attend the grand opening of the facility, and it was quite the occasion! Many local and regional dignitaries attended, gave speeches, and noted the importance of steps like these in the health of rural areas. The fact that many local chiefs, mayors, health workers, and even a parliamentarian were there shows just how vital these efforts are in village life. The facility has four rooms - a delivery room with full plumbing, a recover room for new mothers to stay (also with plumbing), a treatment/consultation room, and a large waiting room area with seating. As the use of the health post develops, we will work with regional partners to fully equip the post with everything it needs. We are very excited to be a part of broadening health care access in Senegal and to see the health of this village and the surrounding community benefit because of it. It was very encouraging throughout the process in working alongside community partners and seeing them mobilize and create a real momentum that will carry this project to success. A huge THANK YOU to all our partners who helped make this a reality! We continue our series with the women of the Keur Soce women’s garden cooperatives. These women are bringing beautiful gardens to life in the middle of harsh and arid conditions in rural Senegal. To learn more about the program and these women, here is part one and part two. Today, we speak with Awa Nair. What have you learned working with Andando in the market gardens in the past year? I learned the practice of gardening techniques, such as how nurseries work, making garden beds, how to plant, how to maintain plants, how to pick fruit & vegetables, etc. Through the training workshops we learned to vary the garden according to the needs of the market and other important practices. How has your participation in the project changed what you believe about yourself? My cash income has increased and I can add more to our household budget. I feel proud that I am able to contribute more toward the success of our household. How has this project changed what you believe about your community? The garden and Andando helps women's groups. So I think that the project called the community into a union and the organization of the work. Before, everyone was in solitude in income-generating activities, but with this project increases our chance of having a better income. The project has created the availability of vegetables and allowed their geographic accessibility because we sell the produce in the local vegetable market. How has the project changed what you believe about the future? We must capitalize on this and develop it not only we who are currently beneficiaries, but, for future generations of women in the community. And also why not for men? How has the project changed what you spend your time on? The project has especially changed the use of our time in the afternoon because we had not much to do. Now, we are in the garden in the afternoon, watering as we do in the morning. On the other hand, today we have the impression of having lost a lot of time before the arrival of Andando. As a result, we feel to be relieved by Andando both individually and collectively. It gives us work for the entire year. How does your dedication in this project show? We put in everything up to the limit of our capacity,physical and intellectual, because we are the beneficiaries of this great program. How has the project changed you as a person? I now know that a woman can support herself in everyday expenses and does not have to rely on the men for everything. How does this make you feel about the future? Our dynamic organization will be strengthened, and with that, the income of households will be increased. We see ourselves developing and we can take that into our own hands. We continue our series with the women of the Keur Soce women's garden cooperatives. These women are bringing beautiful gardens to life in the middle of harsh and arid conditions in rural Senegal. To learn more about the program and read part one of this series, click here. Today, we speak with Kardiata Ba. What have you learned as a member of the Keur Soce women’s garden project? The vegetable garden has strengthened my abilities in new cultivation techniques. Of course, before this market garden, I was trying to practice gardening but it did not succeed. We have learned to diversify the seeded area and now I know how to move forward. It has allowed me to gain a sense of freedom and pride since I am making more income. I am able to pay for many things – especially for my children – that was not possible before. The garden has made the community more united and organized. Working together empowers the whole community and we are becoming more successful together. There is awareness of the importance of time. Indeed, we have discovered that time is investment capital. Before, we spent a lot of time and hard work in the savannah looking for tamarind, jujube, or pick up a few handfuls of peanuts left in the field, but were left with very little. Now, we the effort we put in here, we make much better use of our time. What else are you doing differently? With the savings we contribute each month into our group savings, we believe that tomorrow we can achieve a degree of financial autonomy for the budget of our activities especially for things like tools, seeds, and maintenance. It has made me believe that rural women can actively participate in the development of the community and of Senegal. The entire community knows that we are no longer the unemployed. We are gardeners. How has the project changed the future of the community? The development of the community can benefit from the support of partners such as Andando Foundation. The women working here consider have two major advantages: the economic and nutritional aspects. With these tangible benefits throughout the community things are improving, and we encourage Andando to accompany us yet for new challenges. Andando has worked hard over the last several years to establish thriving vegetable gardens in the arid peanut region of Senegal, in the community of Keur Soce. Working with local groups, we installed wells and solar-powered pumps to irrigate gardens run by women’s cooperatives. They have responded by working hard and dedicating themselves to the success of the garden and the hope it can give for a better future. Beyond the initial investment, our Garden Technicians work with these partners on a daily basis to provide technical assistance, special training workshops, and other support. We recently sat down with Dieynaba Ba – one of the women in the co-ops – to discuss what the project has done for her and the changes she has felt, both in herself and in her community. Despite being one of the oldest members of the cooperative, Ba is extremely dedicated and is out in the garden everyday. The interview was conducted by Massamba Ndiour, Andando’s Keur Soce Project Manager. What have you learned in your time working with Andando and the garden? Through working in this garden with Andando, my abilities in vegetable cultivation techniques have been developed and strengthened. I learned what is organic (no fertilizer or pesticide), what serves as a nursery, how to make garden beds, and how to sustain the beds. I learned to diversify the seeded area to increase production and maintain soil quality. This garden vegetable has allowed me to acquire a new spirit of entrepreneurship. I understand now that I can be more productive during the nine months of the dry season in Senegal. This garden has increased my income and given me hope. Union is strength. It reminds us that the community must continue to unite and organize themselves. Indeed, we are working as a collective status toward the common good of the women members. Andando emphasizes the aims not of the individual personal, but that of the group. For me, the vegetable garden has strengthened the women and given us knowledge in the chain of values for the vegetables - production, marketing and consumption. So, I am excited about the future with the capabilities gained in this Market Garden with the presence of Andando. First, we realize more and more that time is precious. Then consider that, before this project, the nine months of dry season were long and unprofitable economically. Now, we plan our activities on the basis of the work in the garden. The rainy season is brief in Senegal. After this period it is usually the housework that dominated the rest of the year. There was a little trade, but it was not much. Some women wandered in the bush to cut wood to sell, other harvested wild berries. All these activities left us very tired and yet yielded almost nothing. We did not want to sit everyday and do nothing, but there were little options. However today, the Market Garden is nearby and is less tiring and more cost-effective than what we were doing. There is more awareness of the potential that sleeps in us. We feel that can create more wealth. The future is promising if we stay engaged with determination. We love to hear stories like this and personal testimonies of the impact these projects are making! Check back with us on Wednesday for another interview with one of the women of the garden. Workshop Success...and a Near Riot! We recently conducted a small business workshop as part of our ongoing efforts to equip the villagers of Keur Soce with skills to help them thrive on their own. They have diligently worked over the past few years to build a successful garden in the midst of difficult conditions. They have worked to build up the soil, carefully monitored for pests, consistently watered everyday, attentively grown crops from seeds, and organized themselves into operating teams. They are starting to see real success in the volume and quality of produce they are harvesting, but now we want them to take the next step. The goal from the outset of this was to not only provide additional nutritive options for themselves and the community, but also allow them to produce enough to sell, creating a vital income generation stream. Now being in that position, we are developing their business skills so that they can identify markets for their produce, learn ways to be competitive and grow, and create an efficient delivery system. There is some knowledge of these ideas in the village, but they are often confined to very small markets with little or no room for growth and the thought of expanding (outside their small community) seems daunting. And as with any economic system, there is potential for those with little knowledge to be taken advantage of, dissolving any possibility for growth and profit. With this in mind, we brought the women together to teach and inspire them down this road. To say they got excited is an understatement! Teaching largely through storytelling, the women really connected with the ideas and were enthusiastic about adopting the new practices. As the meeting went on, the crowd grew more excited and starting shouting about what this new knowledge could do for them. While the pictures don't do it justice, the event got pretty intense. Fearing there might be small riot, our instructor - Andando Founder Kevin Kiker - asked our interpreter what was happening. He said "they are just so happy!" Another woman stood up and shouted "This is a wake-up call!! ", and everyone joined in the shouting and some began dancing. ....slightly different that most business seminars in America! Time will tell exactly what principles they took away from the whole event, but seeing this enthusiasm was very encouraging. This is the first business workshop in a series with these women, so it will be great to see where this goes. We are hopeful this inspiration will translate into new action toward development, and we really appreciate all the excitement! 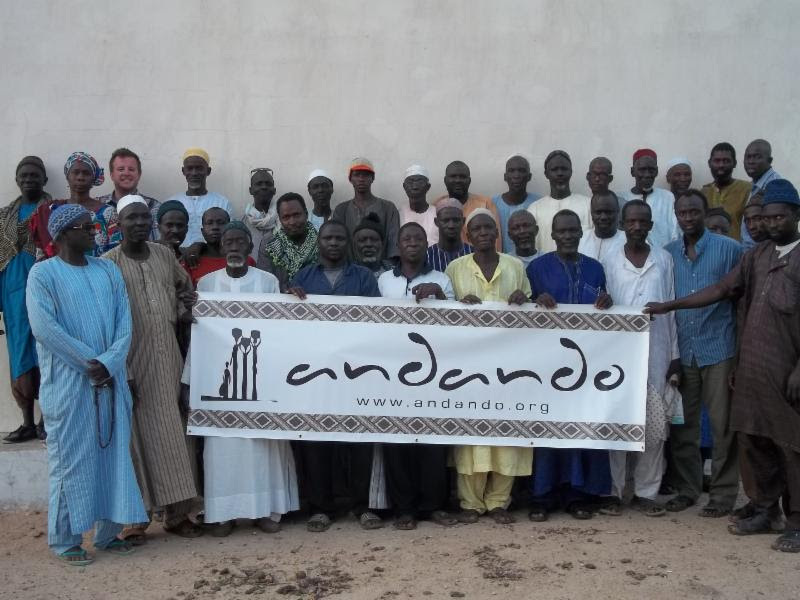 Today is a very important day for the town of Mbouma, Senegal, and a very important day for Andando as well. The town of Mbouma officially opened the brand new Mbouma Junior High School and it is now open and filled with happy students! By partnering with local builders, school administrators, parents, happy students - and all our donors around the world!!! - we are very proud to be a part of this milestone for this rural farming town in southern Senegal. Starting last summer, we asked many of you to join us in building this landmark structure for this community in need, and you responded. Working hard over the last 8 months, we walked together with the people in Mbouma in creating a safe and healthy learning environment that will be the home to future generations. They previously met in harsh conditions, which prompted some parents to pull their children from school thinking it was just not worth it. Now they have a place they can be proud of and a foundation to use as a building block for future successes. The town marked the occasion with a big ceremony where everyone was invited. The village chief, the principal, the teachers, parents, and students were all there, as well as some regional dignitaries representing various government ministries. As is the case in Senegal, everyone makes a speech and the event is marked with much fanfare. They concluded by the first official raising of the Senegalese flag - an important symbol for each school - the singing of the national anthem, and some refreshments for everyone. We were excited to be able to a part of this and we hope you will share in that excitement with us. This is also the first school construction project that Andando has done, and we hope it is just the first of many more to come! Thank you again for all who helped make this a reality! A major highlight of our recent trip to Senegal was partnering with the team from CREATE (an Oregon-based non-profit) to conduct a very successful training on improved cookstoves for villagers in Keur Soce. As in many parts of the world, most homesteads in Keur Soce collect firewood found in the surrounding areas to fuel fires for cooking. However, deforestation is a major problem in this already arid climate, and families must spend more and more time collecting enough firewood to use throughout the day. This is a big burden on families, with some keeping a child out of school in order to go search for wood, as well as a big burden on the local environment. Inefficient cookstoves not only require more precious firewood, but they can also create health problems such as respiratory conditions. In the photo above, you can see the traditional method of cooking over a fire that is inefficient at containing and conducting heat, and then at right is the finished product that can reduce fuelwood consumption by up to two-thirds! Partnering with CREATE, we hosted over 100 men and women from Keur Soce and the surrounding communities to get hands-on experience to build their own more efficient cookstoves. The training team guided them step-by-step and involved them in the process to build a stove to be used daily at Keur Soce Primary School in conjunction with our nutrition program there. Many of the participants were very excited to take this new knowledge home and create one for themselves. The best part of this basic technology is that all the components used - grass, sand, clay, and water - can be easily found in the community for absolutely no cost! Small steps like these can make a huge difference for families by saving them precious time searching for firewood, giving them more time to take care of other important household tasks and potentially saving money. The additional beneficial environmental effects make this a vital part of daily life in rural Senegal and we hope to continue to grow this program and reach more families. The past year has been one of enormous growth for Andando and - more importantly - for the communities we work in throughout Senegal. There has been so many more great things happening this year beyond what you read above, and we are excited about the direction we are going. Thank you again for joining us as we walk together with the people of Senegal, and we look forward to a fantastic 2015! We are excited to see so much progress in just a few short months! Over the summer months, you helped make this school a reality for hundreds of kids in rural Senegal. We were excited by the response we received from people from all over and are well on our way to reaching our goal of $12,000. Previously, the students were meeting in makeshift classrooms that are detrimental to the health of the students and regularly burn to the ground. The construction of this school will facilitate the education of generations of students to come and ensure a healthy and safe learning environment. In just the last few months, we have signed an agreement with the school and the community to provide the materials they have access to - specifically water and sand for construction the blocks that will form the walls. Community members gathered and filtered sand to be used in the construction process and the school pulled together to lay water piping from a nearby well. Construction began about two months ago and the walls are now going up! We have a great team of builders working with community members who volunteer time to help with the project and they are making progress everyday. The school is excited about all these new developments and are eager to move into the new space as soon as possible. Last month, we asked you to help us alleviate the suffering in the Ebola-stricken community of Buedu, Sierra Leone, where Andando has a long history. In addition to fighting the terrible disease that has already claimed thousands of lives, many in this area are struggling to carry on with day-to-day life, now threatened by hunger. With limited resources, those who are surviving are now going hungry as farmers we unable to plant their fields this year because of the risk of infection and illness. Further, the quarantine of entire towns and regions necessary to help slow the spread of Ebola has impacted trade and trucks carrying food cannot reach isolated areas. The United Nations has reported that over one million people now face major food insecurity. You responded and within two weeks we had enough funds to send rice and oil for 250 families. Our contacts got the necessary documents, organised the distribution and brought a little hope to this bereft town that they were not forgotten. It took our team a week to get there because of the poor road condition and difficulty with driving through quarantined areas. When they arrived, community leaders had already registered the neediest families and the distribution took place quickly. People were overcome with gratitude for this relief that can alleviate the suffering temporarily. 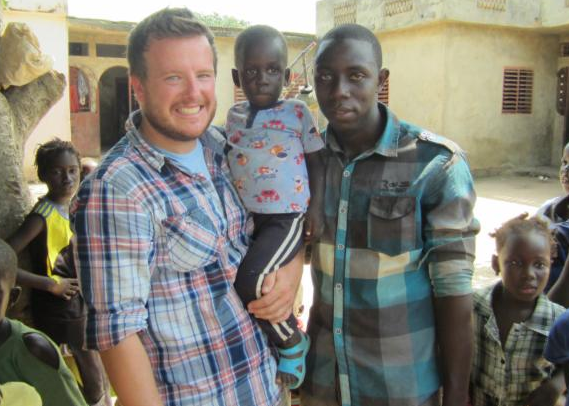 William (pictured in brown shirt) is an eight year old boy from Buedu who tragically lost all his family members to Ebola. He is now alone and often goes hungry. Our colleague - Tamba Allen Boakai - managed to connect him with one of the families who received food and can stay with them until a proper solution is found. Tuwor (pictured in white shirt) lost her husband and their four children to the disease, but was extremely grateful for the assistance and helped with the food distribution. Another woman (pictured with her children) lost her husband and eldest daughter to Ebola and now faces the daunting task of raising her children on her own, compounded by the loss of the two people that worked her family’s field that provided them with food. It is stories like these - and so many more - that demanded action. Andando is primarily involved in development projects - not relief - but this was an obvious emergency situation, a call for help from a community that we had worked with in the past, where we still have many friends that we could not let suffer like this. The community of Buedu is very isolated in the corner of Sierra Leone, near the border of Guinea and Liberia. It is located about twenty miles from ground zero of the current Ebola outbreak and seventeen miles from the nearest Ebola treatment center on virtually impassable roads. Only emergency supplies can get through to Buedu as it is in a quarantined area. Through these efforts, we were able to bring a little hope to this devastated community. But there is still so much that needs to be done. We would like to repeat this process, this time on a larger scale. Since it is so difficult to get supplies to Buedu, we would like to do a larger shipment in December. This would alleviate hunger until the farmers can plant again. Our goal for this effort is $10,000. Please consider a donation to this overlooked side effect of the ebola crisis. The people of Buedu have been through so much sickness death and despair, and now they are faced with battling hunger. A little can go such a long way to helping alleviate suffering, and is something that you can do directly to help a family that has suffered through this unimaginable crisis. To read more about our efforts in Buedu over the years, click here. To read more about Andando and other ways to get involved, click here. Like many rural Senegalese schools, Keur Soce Primary is overcrowded and underfunded. One area where that manifests itself is the lack of sanitary bathroom options for students and staff. The facilities at the school are pushed to their limits and children must find their own solutions, which can mean missing school due to unsanitary practices. The lack of hand-washing facilities and general lack of health and sanitation knowledge contribute to diseases such as diarrhea, causing more students to miss school. To complement the latrine Andando built a few years ago at the school, we are in the process of constructing another latrine to lessen the burden on existing facilities. Further, this will give girls and boys separate options, which will encourage more use, especially among girls. Construction should be completed in the coming weeks before the school year starts in October. To ensure success and sustainability, we will be increasing our efforts to educate students and staff on proper health and sanitation techniques. Collectively, this will boost attendance and enable a healthier student body to achieve more in their academics. We are excited to be breaking ground on the junior high school in Mbouma, Senegal this month! Over the summer months, you have helped make this school a reality for hundreds of kids in rural Senegal. We were excited by the response we received from people from all over and are well on our way to reaching our goal of $12,000. We have recently met with the community leaders of Mbouma to secure proper supplies and materials to begin construction. They are excited to be a big part of the process and have committed to supplying anything they can. While not having much to give, we have asked the community to provide sand for the mixing of concrete and water for many steps throughout the process. They will also be contributing a great deal in the form of labor. We have committed to paying a mason who will work alongside the volunteers to guide them and ensure a quality job is done. We believe that steps like this are crucial to the health of a project - getting people involved and participating. Not only does this reduce costs allowing your dollars to go further, but it also creates ownership among the community, resulting in a lasting solution that will endure. We do not want to build solutions that just patch over a problem, but rather create a sustainable answer that allows the community to flourish for many years. This school will help to educate generations of students in this area and we are hopeful that can bring real change. We anticipate construction taking several months and will be keeping you up on the progress. The school (currently meeting wherever they can find room) is ready to move in whenever it is finished and make it their home! Rural health posts are absolutely key to village life in Senegal. They allow expectant mothers to deliver in a safe environment close to their homes and administer basic care to local populations, among other services. In rural areas, getting to a hospital is prohibitively expensive or time consuming, often resulting in a lack of attention paid to health issues with dire consequences. In order to combat this, Andando has constructed rural health posts in several communities around Senegal, and we are nearing completion on our current one! When finished, the government will staff this post with a trained mid-wife and a nurse providing basic services. This health post will serve over 3000 people in the area! Weaving Success and "Le Projet"
We have another great field report from our intern - Miriam - on people in Keur Soce participating in our micro-loan program. We are excited to announce another round of loan disbursements will take place in the next week or two, which we hope will lead to more stories like these. Further, borrowers in Keur Soce will be participating in small business classes in the coming months as part of the program in an effort to boost productivity and profit. When Ndiaya Diasse first started buying fruit wholesale in Kaolack to sell in Keur Soce, she had to borrow money from family members to be able to afford the large bulk purchases. Her two loans from Andando for 50 000 FCFA each have helped her gain financial security and feel at peace with her finances, and her fruit business has been growing. Ndiaya used one of these loans to purchase a larger table, allowing her to increase her merchandise and thus her sales. She now makes about 5 000 FCFA profit from each bulk purchase she makes, and says she never runs out of clients but often runs out of fruit. Ndiaya’s increased income has ameliorated other aspects of her and her family’s life. She uses her profits to pay for school fees and to buy schoolbooks for her five school-age children, which she often struggled to afford in the past. Her 6th child, Pape Kebe, is still an infant and slept soundly through our interview. She said he is nicknamed “Projet,” the French word for “project,” because Ndiaya was working in Andando’s gardens while she was pregnant with him; Andando’s work is often referred to as “le projet” throughout Keur Soce and the other villages where we work. Naming a child after someone is a great honor in Senegalese culture, and Ndiaya wanted to thank Anando for the support she has received. After five agricultural loans of 60 000 FCFA with Andando, Elhaji Modou Diouf is proud of his fields. During a trip to Keur Soce, Elhaji took us to visit his corn, millet, and peanut fields and show off what he has been able to do thanks to Andando. Elhaji picked up Refilwe, Boubou, Mandou, and me on his older brother’s donkey charette to bring us to his fields in a village just one town over from Keur Soce. We passed through dozens of open fields planted with a variety of crops until we reached Elhaji’s area, which stand apart from the rest because it is surrounded by a fully-grown live fence. Live fencing is especially advantageous because it is self-sustainable, and Elhaji does not have to pay for repairs to maintain the fence. In addition, it is a very environmentally friendly option as opposed to typical fencing with wood or plastic. Elhaji has luckily never had problems with crops failing or poor weather conditions, but in the past he often had trouble finding enough money to buy seeds for the new planting season. With his Andando loans he purchased seeds, allowing him to focus his efforts on other parts of his fields, like his living fence which took 5 years to grow to full size and the small hut he constructed in case it starts raining while he is there. In addition, Elhaji’s wife, Syra Mbodji, has been sick for over a year and only recently regained her health. During that time, Elhaji had to grapple with the additional costs of her extensive treatment, as well as the loss of the income she brought in from her business selling soap. Nevertheless, with his agriculture strengthened thanks to his Andando loans, Elhaji has been able to manage and additionally has been saving money on the side to prepare for the construction of a new home on his own land. Elhaji currently lives with his older brother and his family, but he dreams of being able to build his own home for himself, his wife, and their 5 children. Currently, he has purchased the cement blocks needed and is now saving up to pay for the labor. Yande learned to sew when she was growing up in Ndoffan, a village near Keur Soce. Every Thursday a group of Nuns would come to the Ndoffan church to teach the girls there how to sew with a machine and by hand. When she was about 18 years old, Yande started sewing to sell for a profit, and has been sewing since. When she got married at age 20, Yande’s husband bought her a sewing machine as part of her brideprice, but unfortunately now it is broken so now she mostly sews by hand. She uses a different type of thread, more like yarn, to create colorful patterns and designs on stark white bed sheets, pillowcases, and other materials. Yande’s creations are very popular in Keur Soce and the neighboring towns, and she sells them too quickly to be able to stock a boutique. For now, she is happy to be selling from her home. Usually she makes merchandise for clients who order specific items, but sometimes Yande makes extra merchandise and is able to sell to people who visit her or hear about her goods. Yande reinvests her profits back into her sewing business by purchasing new items like needles and stencils. In the past she has also used profits to purchase a goat or a chicken, which provide additional income for her family. She can sell the goat’s milk or chicken’s eggs, as well as breed them and sell the offspring. Yande’s loans with Andando allowed her to make her first foray into agriculture and diversify the income she makes to support her large family, which now includes grandchildren. She used her first loan to purchase peanut seeds and fertilizer, and she takes the peanuts to Kaolack to sell. Yande told me that her peanut fields provide her with extra monetary security; since her sewing sales are principally based on orders she is not guaranteed to have a steady income, but peanuts are sure not to fail. Though she has not had an Andando loan in years, Yande continues to cultivate peanuts to protect her and her family from hard times. She can now express herself creatively through her sewing without worrying about providing for her family. Faour Djigo comes from a long line of farmers. She learned how to farm when she was younger from helping her family in fields, and now she teaches the children in her family. Especially in rural areas, like Fass Tocouleur where Faour lives, farming may be a family’s primary source of income, so everyone, including women and children, help out in the fields. With a loan from Andando, Faour has been able to increase her own plot in her family’s field. She is a peanut farmer and now, with her loan, can buy additional seeds to plant on more area. Faour earns a small profit from the extra harvest she is able to sell after she saves part for her family’s consumption. But Faour told me that life can be difficult, so she makes sure to put money aside just in case. Faour saves half of her profits to be used in case of emergencies, like if a family member falls ill or her peanut crop fails. The other half she uses to buy ducks or goats that she breeds and sells for additional profit. Faour is now on her third loan with Andando, and she always feels prepared to deal with life’s uncertainties. Adam (pronounced ah-dah-m) Ndaw, one of Faour Djigo’s daughters, lives in the village of Fass Toucouleur, not far from Keur Soce. Though Fass Toucouleur and Keur Soce are only separated by a few kilometers, they are composed of different ethnic groups who speak different languages. Fass Toucouleur is predominantly Fula and Pulaar-speaking, while Keur Soce is predominantly Wolof and Wolof-speaking. Though Adam is of the Fula ethnic group and speaks Pulaar as her mother tongue, she also speaks Wolof as it is invaluable should she travel to a neighboring village. Adam is married, though her husband lives in Spain for work and she lives in Senegal with his family. This is an unfortunate reality for many women in Senegal, whose husbands must travel far for work and leave their wives and family behind. Adam and her two twin sons live with her husband’s family to help out with the housework and upkeep of the family. Adam earns money from her small business selling soaps. She sells powdered soap and bar soap from her home. After her first loan of 25,000CFA (about $50) with Andando, which she used to purchase more soap, Adam used her profits to buy chicks that she raised for her family’s consumption as well as to sell in the village. Adam’s chicken business gives her family additional income from the sales as well as additional nutrients for their diet; in many rural villages in the area, meals consist of mainly millet with little other added ingredients to provide nutrition, as other additives like fruits and vegetables are relatively expensive when cooking for large Senegalese families. Adam has recently received her third loan with Andando, and both her soap and chicken businesses are thriving. On Tuesday, the market day in Keur Soce, I met with Ibou Codou Ndiaye among the hustle and bustle of buying, selling, and bargaining. Ibou is a peanut and millet farmer and also raises livestock, like donkeys that can help cultivate in the fields or pull carts to transport goods. Ibou is currently on his third loan of 60,000CFA (about $120) with Andando, which he used to purchase peanut seeds for his fields. Before working with Andando, Ibou often did not have enough money to buy enough seed. Now, he doesn’t worry about providing for his family with the income he earns from farming. Ibou has even started to innovate his farming techniques to maintain a steadier profit throughout the year. With his most recent loan, Ibou purchased two different types of peanut seeds. One type of seed will germinate in two months, and the other in three or four months. A diversified harvest means steady peanut sales and a steady income for Ibou, his two wives, and eight children. With his increased profits, Ibou has been able to purchase a small cow that helps him cultivate in the fields, which drastically cuts down on the manual labor that he and his children must carry out while farming. In addition, Ibou must no longer pay to borrow a cow to assist with cultivation. Ibou plans on using the profits from this harvest to purchase goats or sheep to breed in preparation for Tabaski, the Senegalese name for the Muslim holiday Eid al-Adha that will take place in October. Senegalese generally celebrate Tabaski by killing and eating sheep and goats, so Ibou is preparing early for the business that is sure to come. We are very pleased to introduce Refilwe Moahi, our new Program Manager Intern based in Keur Soce, Senegal. Refilwe is from Botswana, and has been studying the last several years in the US, most recently at Brandeis University where she is working toward a Masters’ Degree in Sustainable International Development. Refilwe has a passion for and commitment to Africa’s sustainable development and social progress for women and youth in Southern and West Africa. Having studied the political and social climate of Senegal, as well as having lived all over the world and speaking many languages, Refilwe hit the ground running and has been a vital part of our operations in Keur Soce over the last month. We are excited to have a full-time intern monitoring and evaluating our programs in Keur Soce and Refilwe has dramatically increased our ability to be efficient and effective in the work we are doing. With her background in Sustainable Development, we will be using her experience to implement initiatives to further sustain our programs in as we move forward. Refilwe will be in Keur Soce through the summer before she heads back to the US to finish her studies. She was able to come on board through our partnership with Vibrant Village, and we are excited about the possibilities for this kind of cooperation in the future. Penda Diop struggled through primary school. Her father died when she was very young and left her mother as a poor housewife with a heavy load to bear. Her mother then passed away when she was in grade 3. She found herself alone, but was able to continue her studies through the generosity of a caretaker in the community. She proved herself a very willing and clever student and passed the entrance exam to further her education at junior high school. However, the nearest school was many miles down the road and she would have to find somewhere to stay in the new community. Having no financial resources to pay the school fees and no family to stay with, she had to drop out of school. Penda now must fend for herself and has gotten a very low-paying job as a maid in a nearby city. She has almost no hope of going back to school and very limited opportunity to get a better job and improve her situation. Consider helping kids like Penda by donating here. There are many students like Penda in the town of Mbouma who have the capability and willingness to succeed in school if given the chance. If Penda and her friends had a school in their town, she would not have had to drop out and leave the village. There are many children like Penda who can have hope for a better future if we are able to help them build the school they deserve. Learn more and participate in her story visiting our fundraising site on Global Giving. Thank You!